I guess a flyover costs $200 million. Smart timetabling costs a lot less! Are they timetabled like that to both meet a connecting bus at Sunshine or something? 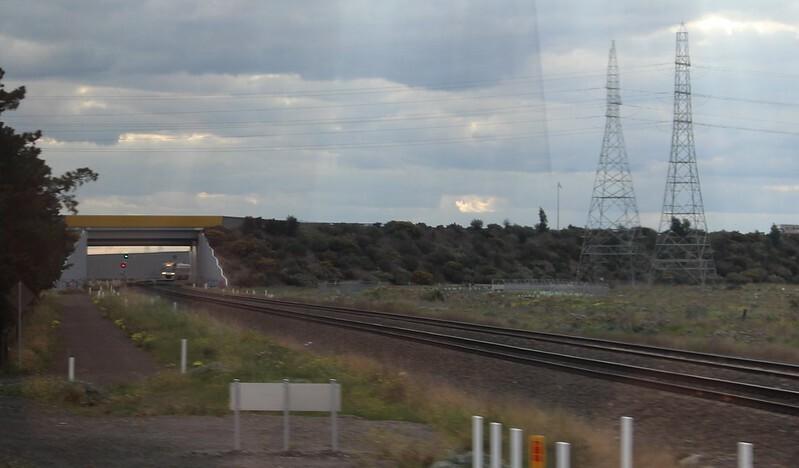 See “Deer Park Junction up side of Robinsons Road 5 track corridor with grade separation of down Ballarat line and passive provision for Western Freight Link through Deer Park”. Smarter timetables (and more access to real-time information) would make a great difference for minimal effort. There should be an effort to have logical frequencies where it is feasible to do so. Richmond to South Yarra on early weekday evenings: Dandenong / Frankston / Sandringham trains run at a 20 minute frequency, but all within 2-3 minutes of each other. South Yarra to Caulfield after 10pm on weekday evenings: Pakenham trains stop all stations after 10pm but they run 6 minutes before Frankston trains, resulting in a 6/24 minute gap. There is a 15/15 minute gap at Flinders St., but one train runs through the loop (adding 9 minutes), one doesn’t. Disagree re provision for additional tracks through St Albans. An alternative strategy would be to run Bendigo trains as Sunbury – Tullamarine – Albion – Sunshine. @Roger, I think a typical flyover is closer to $80-90mil for two tracks over two tracks. @Roger, it shouldn’t cost anywhere near that amount. Level crossing removals at the very extreme can cost $200m, but much of the cost is in moving existing underground services and closing active rail lines for extended periods. @jon, I had a quick look, and couldn’t identify any bus route that was an obvious candidate for such a connection. Many in that area actually run every 20 or 40 minutes on weekends – the latter wouldn’t work well connecting to hourly trains. @Marcus, as I suspected, not a rare occurrence! @nick, the Frankston and Pakenham/Cranbourne trains running like that is deliberate; people from the Loop are meant to have time to board a P/C train and hop off at Richmond or Caulfield to change to the Frankston train. 1. Deer Park stops are too inconsistent. They can’t seem to decide if it’s on the Geelong line or Ballarat line, or both. 2. Tarneit has half the peak services that Wyndham Vale has, despite being twice as busy, and having about 5x the catchment area. 3. Interpeak patterns are absurd. One stops all stations except North Shore. Why skip just one station? Especially that one, which has just become a major bus interchange as part of the new bus network. Also, the station is now part of the severed Lara-Corio SC journey which was once a one seat bus trip. 4. During peak hour you get bunches of trains departing SSS within a few minutes of each other, and then big gaps. It is causing congestion on the common section of the three lines. Those are just a few issues with the timetable where they could’ve done better quite easily. Of course there are then other issues, like inadequate service frequency on weekends, which could cost some money to address. No extra weekend services were put on despite diverting an already full line through Australia’s fastest growing growth area. I’ll just add that the Geelong line trains departing from numerous different platforms at Southern Cross (many with destinations on the displays not actually mentioning “Geelong”) is very unfriendly to passengers. @Daniel If connections from loop services to Flinders St. direct services at Richmond are from Burnley group to Caulfield group services and vice versa, then there can be a 15 minute service to Caulfield and Burnley at night (excluding any complications from making Ringwood-bound trains stop at East Richmond). This kind of slack timetabling isn’t just limited to V/Line. The flat junction at Clifton Hill causes some problems, but it is not at all helped by the timetable, which just serves to delay passengers. Since 2011, all inbound South Morang trains wait for 3 to 5 minutes before entering Clifton Hill. This makes no sense on three levels: the single track sections are all on the Hurstbridge line, South Morang is one of the most reliable lines, without any constraints on the line, so the forced 3-5 minute wait does not do anything for timetable recovery – the most common scenario being the South Morang train waits even longer between the two stops. The trains always wait, even before the first inbound Hurstbridge service, and after the last outbound Hurstbridge service, which makes no sense. The line is already the slowest in the network, consider the 11 tram running down Brunswick St (40km/h speed limit!) takes only 22 minutes to reach Thornbury from Parliament interpeak, while the train takes 20 minutes (there’s no 3 min wait outbound) – slowing it further with a pointless wait is absolutely counterproductive. All that needs to happen is for trains to depart South Morang 3-5 minutes later, and it saves everyone 3-5 minutes a trip. Sometimes the best solutions don’t need to be bought with hundreds of millions of dollars worth of concrete, really simple stuff like rectifying these sorts of issues go a long way to improving service, but they’re just overlooked. @Campbell, Clifton Hill is perhaps made worse by the ~200 metres of track that is shared by inbound South Morang and Hurstbridge trains and outbound Hurstbridge trains. But yes, it’s notable that in the timetable South Morang trains are allowed 2 minutes Clifton Hill outbound to Rushall, but 4-5 minutes in the opposite direction. I suspect that the reason that so many lines have trains that depart relatively close to the trains on lines they share at times of low frequency is an attempt to reduce driver layover times at Flinders St Station. I find this to be a somewhat bogus argument. If the other train is running 5 minutes late, and your train has to wait, then why doesn’t your train go first ? Your train will be gone before the other train arrives. The reason why you can’t, is poor communication and operational inflexibility. Those are obstacles which can be worked around, if there was any will to do so. The situation with services to Deer Park and Ardeer (especially the latter) is absurd. Like the last train that actually stops at either one or both of those stations leaving the city at 10:25pm, despite there still being express trains leaving the city until after midnight. Or the 70 minute gap between city-bound trains from 5:20 to 6:30am, whilst FOUR express trains pass through during that period! Not to mention the two-hour gaps between weekend services with multiple express trains passing through during the gap, or the 2-3 hours a day when it’s impossible to catch a train to one or both of those stations, even though Geelong trains are running (but not stopping). I think they need to work on ensuring that everybody has at least a reasonable level of service first rather than making saving 2 minutes for people from Geelong the ultimate highest priority as they do. Those anonymous Train driver’s comments are interesting and things that I have seen. I think it would be best for every line if they picked 2 or 3 (at max 4) stopping patterns and stuck to them. Then you could give them names (Stopping All Stations, Limited Express, Express), draw up stopping pattern maps and images to visualize it. They seem to be running Trains to Wyndham Vale and Tarneit as if the line to WV has already been electrified from Werribee providing access to imaginative transfers. I don’t think it helps that they are trying to run three different train lines with 3 different frequencies, 20 min, 30 min and 60 min on the same tracks. With uneven gaps no matter how you space them, they’re going to end up closer together anyway. The names of lines need some work, I’m a regular commuter, but the rest of my family aren’t. They were completely confused to get to Southern Cross and find that they needed to catch an Epsom Train to get to Kyneton. They should be listed as ‘Bendigo-Epsom’ like they are announced at Metro Stations (which I dislike) or have the Display Boards split up by line groups. If you have consistent stopping patterns, passengers for stations with less frequent services will also be able to see if the next train goes to their station. A thought; with the South Gippsland highway level crossing removal as it is likely to be elevated (industrial area). I am wondering if they could add a flying junction with the Cranbourne Line when they are doing it. I would strongly suggest the South Gippsland Highway to be closed off. Most of the traffic can divert onto the existintg Dandenong bypass, then Frankston road, and gets you to Princess highway only meters away from where the South Gippsland Highway is anyway. I can not understand why the Geelong trains are not stopping all stations out from Sunshine. I would have said that, Deer park deserves a 20 minute frequency now days. That matter gets worse. The Whyndam vale peak hour trains, service only two stops, when the longer Melton line trains must service Deer Park alone. Closing the South Gipplsand Highway Level crossing of the Pakenham seems like a good idea. I doubt it will ever get up though.